What a beautiful day for a race. 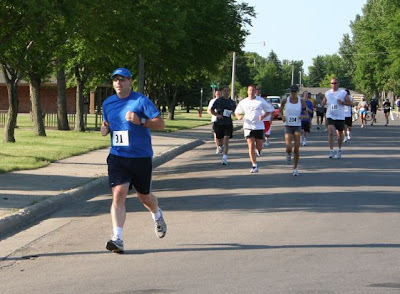 The air was clean and clear and the temperature was around 58 °F at the start of the race. 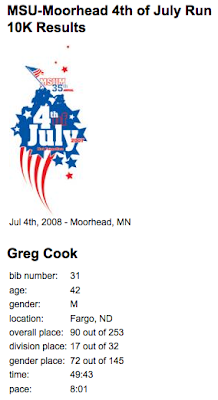 I made my way over to the track on the campus of Minnesota State University Moorhead around 7:30 to pick up my bib. After stretching a little bit and warming up I lined up at the start. This was a chip timed race but they didn’t have starting mats, 0nly finishing mats. So, your time is based on the gun no matter where you start in line. Fortunately this race is rather small with about 250 people, so it wasn’t a big deal. I was about 1/3 of the way back from the start – maybe 15 yards. My goal was to finish in less than 50 minutes. 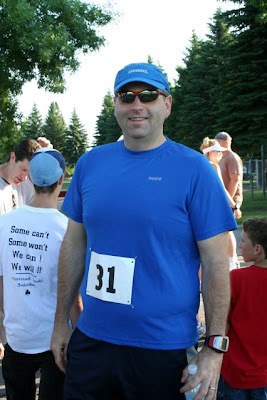 I made my 10K PR of 48:48 on this out and back course in 2006 but I am a little bit heavier now than I was back then, so I didn’t expect to beat that this time. The gun went off right at 8:00 taking me by surprise a little bit. I sprinted out of the starting gate west along 6th Avenue. I was feeling really good and established a consistent fast pace right from the get go. West for half a mile or so, a turn to the left for a few blocks and then back east on 9th Avenue got me to the 1 mile mark in 7:42. I felt a twinge in my knee but it quickly disappeared and it was fine for the rest of the race. We came up to 20th street and at about 1.5 miles and I was still feeling great. My pace stayed pretty much the same but my heart rate was climbing over 170. I turned south on 20th Street and hit the 2 mile mark with a 7:49 mile. Slipping just a bit but still within my goals. The course went another mile south where we turned around to follow the bike path back north. Mile 3 was a little bit slower – 8:04. I was starting to feel the fatigue at the half way point and I was thinking – “This would be great if it were a 5K race!” But I dug down deep and pulled it out from within. Mile 4 – 7:55 YES! Mile 5 – 8:02 – Ok . . Hold ON! You’re almost there. Mile 6 – I had to let up just a little bit. My slowest mile of the race was the last mile 8:12. I could see the end in sight and when I came around the corner and turned into the Nemzek field I let it all out and finished strong. 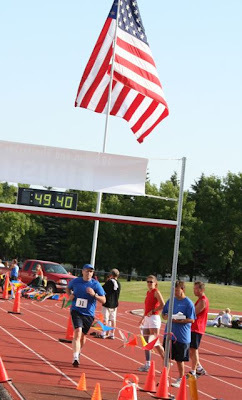 My official time – 49:43. Not bad. Made my goal but not a new PR. I was happy with my race.